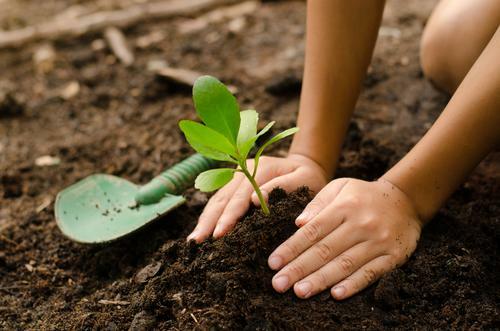 Follow these green gardening tips to reduce your carbon footprint. A garden is one of the best places to seek refuge from the hustle and bustle of our daily routines. Tending and nurturing plants is a proven way to relax and remove stress: a study conducted in the Netherlands found that gardening can reduce stress hormone levels better than reading indoors. A green garden also provides fruits, herbs, and vegetables that will taste better (and fresher) than the bland, colorless produce in your local grocery store. Plus, a few easy swaps can actually boost your gardening game by making your hobby more sustainable. Sustainable gardening uses organic, environmentally responsible methods to build a green garden. Many commercial gardeners follow these practices, and you can use the same tactics to keep garden healthy — and reduce its impact on the environment. Here are three simple gardening tips to get started. Happy digging! Before you apply any fertilizers to your garden or your lawn, you should test your soil thoroughly. An earth test — even a basic one — will let you know which nutrients are already in your garden soil, which impacts the levels of fertilizer and water pH you should use. A simple earth test will also help you find out the acidity level of your ground. Even though a specific nutrient exists in your soil, it might be unavailable to your plants if your soil pH is outside a certain range. You can do this test yourself by purchasing an inexpensive screening package online, or you can find one at your local garden center. You can even use your county extension office to get your soil tested. This route will usually give you a more detailed analysis of your soil, as well as specific advice for adjusting and improving your soil condition. You can’t just dump a pile of fertilizer on your plants without a caring about their nutritional value or environmental impact. In order to be sold as fertilizer, all fertilizer products must be clearly labeled with their levels of the three major plant nutrients: nitrogen, phosphorous, and potassium (NPK). Synthetic fertilizers can act on malnourished plants immediately, which makes them tempting if you’re dealing with a lackluster garden. They also have consistent levels of NPK. However, synthetic fertilizers are damaging for the environment: they kill beneficial microorganisms, and they can increase nitrate levels in the soil. Organic fertilizers are consistently a more responsible choice for your garden. Because there is some variability among organic fertilizers, you’ll need to determine how much fertilizer to use and when to use it according to the manufacturer’s tips. Using too much fertilizer or the incorrect formulation — or even using fertilizer at the wrong time — can seriously harm your plants. Consider sustainable fertilizer alternatives, like compost bins, which make it easy to recycle your kitchen waste. Seed dehydration is one serious side effect of misusing commercial fertilizers. Many home gardeners cure this by overwatering their gardens. All of that wasted water seriously damages your surroundings — and increases your energy cost. If you’re trying to save fertilizer-poisoned crops, check the pH of your water. 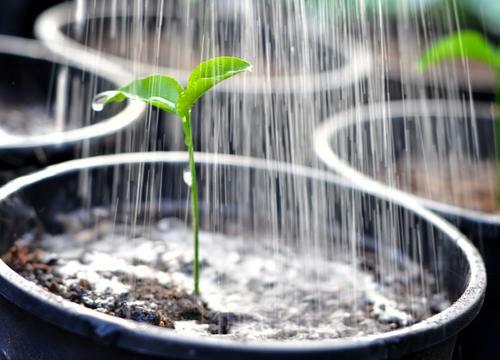 While distilled water has a neutral pH of 7, some plants might need a lower pH to thrive. You can use tap water in your garden as long as it’s free of chlorine and hard water minerals. Otherwise, you’re wasting water in your attempt to keep your garden looking green. Excess water also has a darker side if you’re using synthetic fertilizers. Once it’s absorbed into the dirt, it eventually works its way into groundwater, which moves synthetic fertilizer residue into creeks, streams, lakes, and rivers. According to Scientific American, excess nutrients from fertilizer can cause algae blooms — and sometimes, those blooms can make our waterways impassable. When the algae die, “they sink to the bottom and decompose in a process that removes oxygen from the water.” This process creates “dead zones” where fish can’t survive. Alongside using organic fertilizers, hoarding rainwater is an easy way to cut back on excess water usage. Using rainwater to water plants not only saves money on your water bill, but it also avoids erosion. Rainwater is natural and has no added chemicals such as chlorine. Use barrels to capture rainwater, but be sure to cover it so that insects, birds, or dirt won't get into it. Additionally, water your green garden carefully by watering early in the morning and directly on the roots of your plants. During the summer, add a layer of mulch to keep the soil moist and slow down evaporation. If you sneer every time a bee buzzes in your green garden, you don’t appreciate how important they actually are. 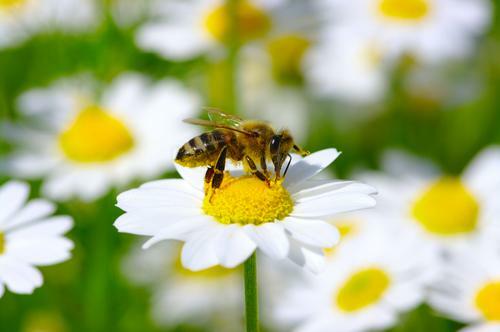 Bees play an essential role in the pollination process for a wide array of flowering plants. Add a diverse array of bee-attracting plants throughout your garden at different heights and sizes, which will attract pollinators throughout the year. Bees prefer blue, purple, and yellow flowers. Plant daisies, Queen Anne’s lace, asters, and zinnias to attract a variety of bees. Monkshood, snapdragons, larkspur, and herbs in the mint family — including lavender, mint, and oregano — will attract long-tongued bumblebees. Avoid using pesticides, which are toxic to garden-friendly insects. Instead, opt for techniques like crop rotation and hand-picking in order to control pests. Certain plants will also repel pests, including mosquitoes, ants, and aphids. Check out our full companion planting chart for more information. A sustainable, green garden is a beautiful way to grow flowers and enjoy fresh fruits, vegetables, and herbs. With a few simple steps, you’ll put your green thumb to work without risking long-lasting damage to the environment. How do you keep your garden sustainable? Let us know in the comments below. About the author: Shary Saunders is a blogger at sharycherry.com. Gardening and landscaping have been her passion for years. You can find Shary on Twitter at @SharySaunders. "Using rainwater to water plants not only saves money on your water bill, but it also avoids erosion."